Melbourne turned it on today. 2 days in a row. The sun blaring out, 15 degrees outside. Fantastic. The cold mornings were indicators of a great day. With this in mind, i took my camera, and headed towards Brighton. Destination : The Pantry. Listed in the age good food guide as ……….., I was semi looking forward to this. It may have been the fact that I hadn’t had a decent breakfast in 2 weeks, unless you count cereal and milk as decent. The Pantry was a bustling place inside. The outside seats were empty, but only being 4 or 5 degrees outside, you couldn’t help but want to sit inside. Though they do have outdoor heating, and it wouldn’t be such a bad spot under a heater. Indoors though it was for me. The waiting staff all had smiles on their faces, and provided good service. 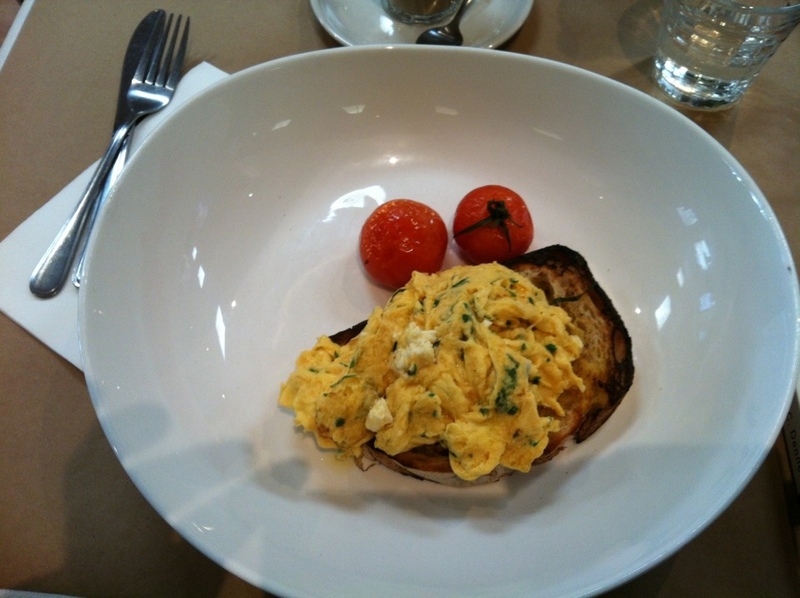 I ordered a latte as well as the herb scrambled eggs, with feta and slow cooked tomato. Im generally not a fan of tomato on the side of my breakfast, but it came free. I have to admit though, i was hoping to get some ricotta hotcakes on the menu to try again the Bistro Flor ones have really floored me ! After tasting the tomato, I immediately thought I need to look this recipe up. The herb scramble, ( I’m not sure whether this was the menu item, but let’s indulge for now). The herb scramble was pretty darn good. The wry of feta, eggs and herbs was finely balanced. A good mix. One of the better I have had. The Pantry is a good spot, and would recommend this, and being close to the beach, it’s a good spot to go afterwards and relax.